Some of the Bay Area firefighters who have been helping with water rescue efforts in Texas in response to flooding from Hurricane Harvey arrived home late Monday. A total of 47 personnel flew home to Oakland International Airport on Southwest Airlines and touched down about a little after 7 p.m., according to Aisha Knowles of the Alameda County Fire Department. The returning heroes were greeted with spontaneous applause as they arrived in the airport terminal after working 14-hour days to ease some of the misery from Hurricane Harvey. "Search and rescue, technical support, hazmat mitigation," said Charohn Dawson of the Alameda County Fire Department, describing their various assignments. "Everything up to documentation and planning and so forth. Everything our team is capable of handling." 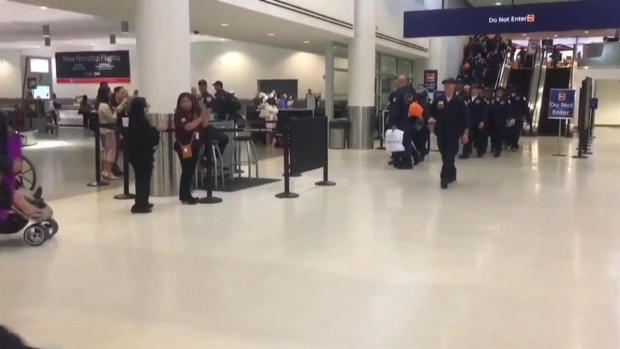 Firefighter rescure crews from across the Bay Area who were sent to Texas to help Hurricane Harvey victims returned home Monday night to a rousing ovation as well as hugs and kisses at Oakland International Airport. Oakland's Task Force 4 engineer Joe Ortiz said his team came to the aid of dogs, cats and birds and some larger animals that needed a Texas-style rescue. "The cattle were up to their ears in water, and the people from Texas were there to help wrangle the cattle and take the high ground and also the horses," Ortiz said. "A very Texas moment!" Another 26 firefighters are driving back with the equipment and are expected to arrive Thursday or Friday, Knowles said. The team consists of firefighters from central San Mateo County, Palo Alto, San Mateo, San Jose, South San Francisco and the Menlo Park Fire District. It was sponsored by the latter district, which is headed by Chief Harold Schapelhouman. The search and rescue teams may not be home for long. If Hurricane Irma comes ashore in Florida, there's a chance the team will be flying out again as early as this weekend.